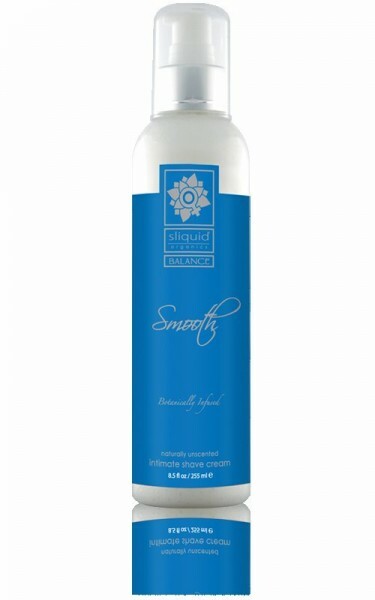 Sliquid Smooth Naturally Unscented 8.5 ounces. Sliquid Smooth is a gentle, rash free, intimate shave creme and is formulated completely glycerin and paraben free. There are four fabulous formulations of Sliquid Smooth; Spring Blossom, Honeydew Cucumber, Grapefruit Thyme, and Naturally Unscented. All four are great alternatives to traditional soap & water or other harsh shaving foams. Fragrance formulas are blended with mango butter, shea butter, green tea extract, vitamin E, and essential oils. Sliquid Smooth will not contribute to animal cruelty, and therefore will not formulate with lanolin.Sliquid Smooth Ingredients: Purified H2O, Plant Cellulose, Cetyl and Stearyl Palmatate Derived from coconut oil, Mango & Shea Butters, Green Tea Extract, Cetrimonium Salts, Aloe Vera, Vitamin E, Essential Oil Fragrances, DMDM Hydantoin.